« Who named the Speedbird? In the past, Seiko have resurrected long discontinued calibres – the notable such reintroduction being the 4S15 (originally the 5246) which itself was received with much aplomb given its high beat of 28,800 bph, it’s hacking ability and the hand winding. The 5246 was itself a very high grade calibre, more than capable of chronometer accuracy; indeed, it was utilised in various KS (King Seiko) models with official certification. Having owned various models so equipped, I had a love hate relationship with the 4S15- it was extremely hard going to handwind and the indirect central seconds often resulted in an annoying jitter of the seconds hand. Nice movement all the same! The Seiko 4R36 et al movements appeared sometime during mid 2011 and much excitement ensued simply for the fact that Seiko was now equipping relatively run of the mill watches with a movement capable of being handwound and hacked. Here and there on various watch fora have appeared pretty in depth posts regarding the construction of the ‘new’ 4R movements and I certainly wouldn’t attempt to replicate those here. Suffice to say, the precursor to the 4R family was the 6R15 – and this movement was intially used to power the likes of the Japanese market SARB (Spirit) series, introduced late 2005 and the now highly regarded SBDC001 ‘Sumo’ dive watch, introduced early 2007. The 6R15 was notable for the same reasons as the later 4Rs – hacking and handwinding; in addition, the 6R15 featured a Spron 510 mainspring which gave the calibre a power reserve of over 50 hours once fully wound. What is significant is that the 6R15 was a development of the venerable 7S26, Seiko’s workhorse movement which has been powering bread and butter 5s since 1996. Thus, it wasn’t a reintroduction (as per the 4S15), it was a re-engineering of an existing, well proven calibre in order (arguably) to bring Seiko’s mid range offerings into the territory of basic ETA 2824 equipped watches. As is the way with Seiko, the 7S26 has been developed during ts lifetime, starting with the A variant (1996-2006) and progressing through the B (late 2006-2011) to the current C version (late 2011 onwards). Likewise, the 6R15 is now on its third variant (C) since first appearing in late 2005. For clarity, we should really start with the 7S25 as this calibre is date only (as is the 6R15). Confusing?! So where does the 4R series fit in to all this? Well, sometime during mid-late 2008 the first 4Rs, in the guise of the 4R15 and 16 appeared (notably the 4R15 in the Seiko SRP043 ‘Spork’ dive watch). Models were prefixed SRP and the watch designs were a step above everyday Seiko 5s; indeed, the very first SRPs such as the SRP001 (with day date 4R16) were fitted with solid link bracelets (including endlinks) and sapphire crystals. 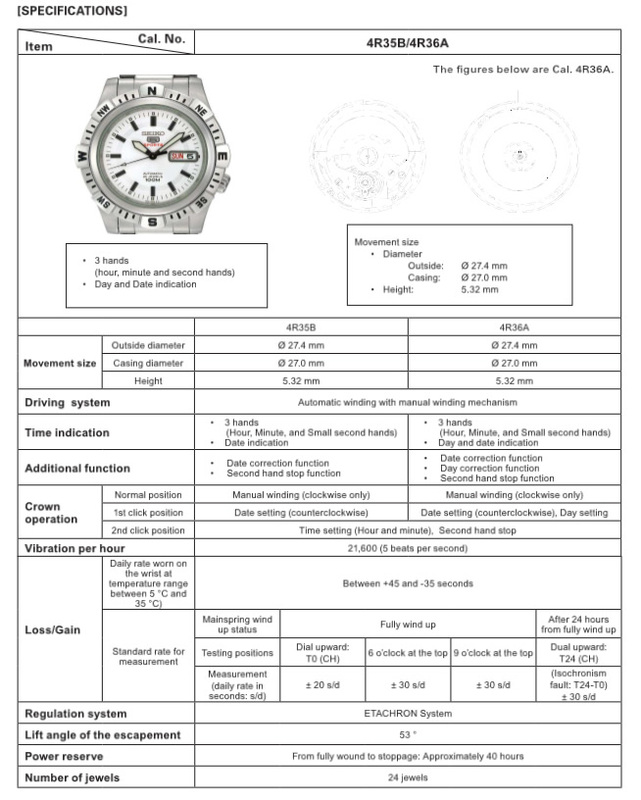 Some sellers marketed the watches under the ‘Superior’ moniker which Seiko itself had officially used in the mid 1990s with 4s15/sapphire equipped watches. I am not sure if Seiko themselves are marketing these as ‘Superiors’. At first sight, (apart from being slightly more visually attractive with decorated rotor) the 4R15 is a 7S. In essence, however, the 4R15 is a 6R15 with the hacking and handwinding facilities removed – the 50 hour power reserve remains courtesy of the Spron 510 mainspring. It could be argued that the 4R15 is therefore simply a 7S25 with an upgraded mainspring! The whole journey from 7S series through 6R to 4R is quite complicated but it would seem that if there were any purpose to all these swings and roundabouts, then such purpose has become apparent relatively recently and would at the time of writing relate to the establishing of a degree of parts commonality between the three series of calibres. This wasn’t always the case of course but does now seem to be so. If we look back at the introduction of the 7S26B back in 2006, the base movement had been in production for a decade with no real changes. The major difference was a complete redesign of the regulator which was now of the Etachron type. In essence, this would allow for finer or ‘better’ adjustment of isochronism (in other words, it would accomplish more stable timekeeping despite a declining mainspring tension). Indeed, initial reports of the performance of the 7S26B certainly indicated that out of the box timekeeping was somewhat better than the previous series. This was all rather encouraging as the 7S series had become a firm, if not crude favourite over the years but was certainly not renowned for the best of accuracy without adjustment. From personal experience the accuracy of the 7S26 in B guise was very much improved; I owned an SNKH63 which ran at +2 sec per day right out of the box. However, what was intended to improve the calibre turned out to be a little problematic in some cases; the design of the new regulator meant that the hairspring could be prone to jumping out of the regulator pin and becoming ‘hung up’ if the watch was subjected to any degree of shock. The watch would then run crazily fast or stop altogether. This problem was reported by many users with the quick and dirty fix (rightly or wrongly) being to slap the watch on the palm of one’s hand. I have heard it mentioned that the issue itself may have simply been down to poor adjustment of the rotatable regulator pin at time of manufacture. “I just came from the Seiko House at G5 this afternoon to have one of my pieces A-Graphed and regulated (took all of 52 seconds). While there, I had a short chat with the watch smith, a friend of mine for the past few years. He says the 4R36 movement is very similar to the 7S lines. So for 4R36 et al owners this would seem to be good news. 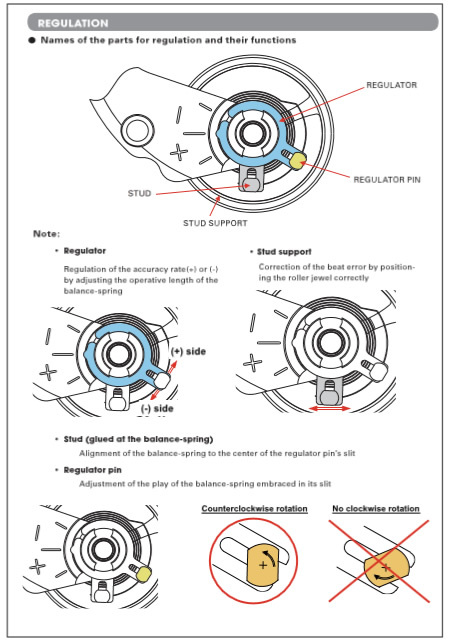 It should be noted also that within a very short time of the 4R36 being introduced, the 7S26 was uprated to the C series…with a new balance assembly (to negate the problems?) amongst other changes. 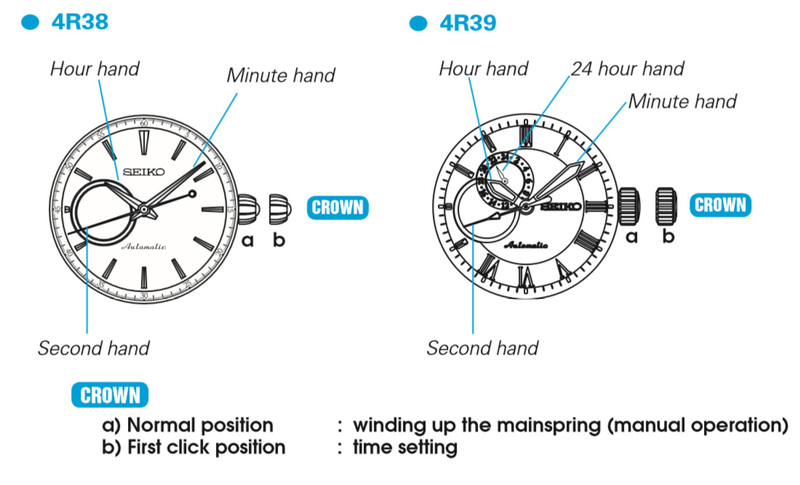 So…hopefully the hairspring issue is now a thing of the past, providing your watch has a 4R series movement or a 7S ‘C’. 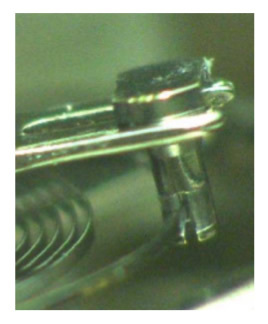 The image at right shows the hairspring passing through the slot in the regulator pin; turning the pin anticlockwise achieves fine adjustment. 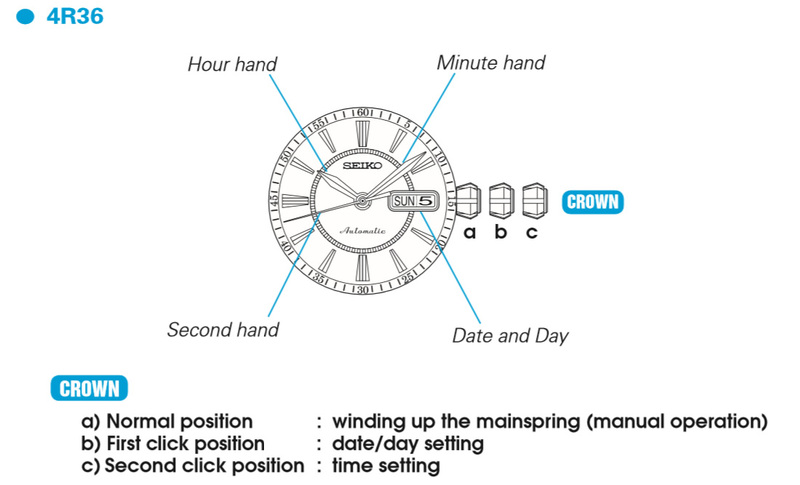 Current basic Seiko 5 models are therefore equipped with the 7S26C, some Seiko 5 Sports with 7S36C, more recent Seiko 5 Sports with the 4R36A and Japan domestic Spirit models with the 6R15C. There are no less than seven variants in the series which given their differing configurations, are suited to a variety of watch designs from basic dress to the ubiquitous Seiko Sports. Certainly the introduction of the 4R series has gone hand in hand with the introduction of many new models; in the case of the 4R36, many Sports models with 100m water resistance. Seiko has not chosen not to re-equip existing watches with the new calibre thus far, with the exception of the ‘Monster’ dive watches which have been given minor aesthetic changes, new model numbers and a commensurate price hike. The exciting (?) thing is that finally there is a relatively mainstream Seiko watch that can be hacked and handwound – whether or not the 4R series find their way into mainstream Seiko 5 models remains to be seen. 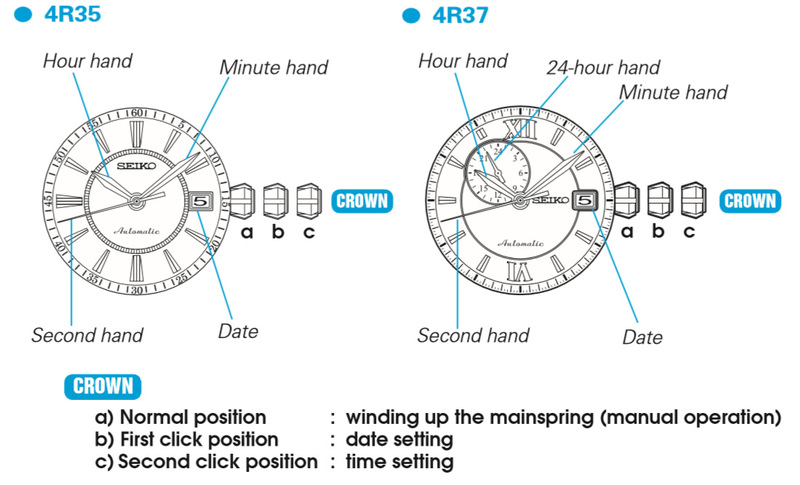 The image below gives the basic technical specification of the current 4R35 and 4R36 from Seiko. Accuracy figures thus far reported online would indicate that Seiko are being somewhat pessimistic! Note that the movements beat at 6 beats per second, not 5. The new movement seems complete in way that it never was when the 7S26 was the mainstay – I could live without hacking and handwinding without problem – but it is nice to know that it is there if required. Citizen’s 82** series movements have always handwound but not hacked, have indirect centre seconds and of course the rotor wobble associated with winding in one direction only; wonderful workhorse movements but for me, never quite Seiko quality (despite better accuracy). The new Citizen / Miyota 9015 as used in the Smiths PRs-25 and now the PRS-68 is a whole lot better than the 82** but hard to find as yet in lower priced, relatively mainstream watches. Seiko afficionados might baulk at some of the designs which have been released to encase the 4R36 and Seiko have gone the way of many manufacturers by releasing some very large (and ugly in my opinion) watches; thankfully (for me) not all are such, and a few of the post 2011 SRP releases have certainly caught my eye. Tagged 4R36, 6R15, Seiko, Seiko 4R36. Bookmark the permalink.